Can enchantments I control effect my shroud. i've never seen a merfolk deck in simic colors actually be played at modern fnm. its always mono blue. 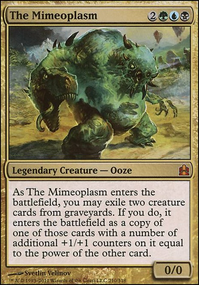 modern is a pretty fast format and anything with a cmc of 5 or higher needs to be able to provide immediate impact on the game in the same turn its played. the other big drawback of your plan is that you have to dedicate space to mana ramp when you could be using that space for removal spells. you'll spend your early game ramping instead of interacting with your opponent, then even if you do drop something big, it gets hit with Terminate or Path to Exile. if budget isn't an issue, Tarmogoyf can come down big if you use fetchlands and Thoughtseize, and Death's Shadow can also get pretty big. in a simic colored deck, they can turn Stubborn Denial into a hard-counter right away while being cheap enough to allow the use of the Stubborn Denial in the same turn. Kvothesixstring: Simic Sky Swallower is 7 mana and doesn't do anything the turn its played. not worth it in modern. with the ramp you suggested, it is actually extremely unlikely to have 7 mana available to use turn 3. EXTREMELY. that would require a 1-mana mana dork on turn 1, and 3 more on turn 2. by turn 3, a player will have seen 9 cards from their deck if they're on the play, and to have 7 mana on turn 3, 4 of those would have to be 1-mana mana dorks, and 3 would have to be lands. that only leaves 2 cards in hand. and 18 lands is FAAAR too few for a deck trying to cast spells with a cmc 5 or higher. you want 24 minimum to ensure a land drop for the first 4 turns. by a players 4th turn, they'll have seen 10 cards from their deck if they're on the play. if you want 4 of those 10 to be lands, 4/10 of your deck needs to be lands. 4/10 of 60 is 24. also, Birds of Paradise is strictly better than Llanowar Elves or Elvish Mystic considering this deck isn't mono green or elf tribal. I find it boring that most Simic decks are also Merfolk Tribal decks, and I love playing Simic. Here are a few creatures I run in my simic EDH deck. Simic Sky Swallower is a big baddy. Flying, Shroud, and trample at a 6/6?? Worth it. Kruphix, God of Horizons is a mana winner, as is Prophet of Kruphix. I'd throw in 4x Llanowar Elves 4x Arbor Elf and 4x Elvish Mystic then run only 18 lands. And maybe a couple of Farseeks.If you get the right hand, and draws, you could potentially have 7 available green mana on turn 3. Enough to fetch your library for an island or two, and put out a decent sized creature. The last "staple" card I'd put in would be 4x Alpha Authority: hexproof and a little bit of unblockablility is nice. 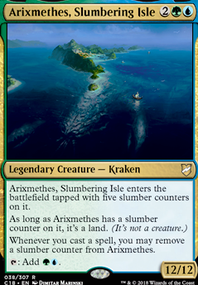 Then maybe find run some Spreading Seas in case you have islandwalk creatures or need an extra island on your end. Remove the 4 Dakra Mystic and add 4 Opulent Palace. Your deck LITERALLY cannot cast Simic Sky Swallower or wrexial the risen is what he is telling you. You have 33 creatures and 19 land, and you're playing expensive creatures that require a copy of 1 particular card to make your deck cohesive. You'd almost be just as well off if you took out Quest for Ula's Temple and just fixed your mana base. Criaturas que sacaria:- Fyndhorn Elves Llanowar Elves Elvish Visionary , Elvish Mystic monos que dan mana? mejor pon el trio de muros que se ayudan: Overgrown Battlement Vine Trellis Sylvan CaryatidDe cualquier manera es mejor poner mana rocks creo yo. Ezuri, Claw of Progress: y pa que este mono aca, si no es pa ser el comandante es re poco lo que ayuda. Simic Sky Swallower , Sagu Mauler.- bicho grande..con velo/hexproof. Altered Ego, Phyrexian Metamorph .- monos toolbox, siempre ayudan, son buen soporte. Edric, Spymaster of Trest .- robar si haces dao..no esta mal. Horizon Chimera .- viendo que quieres robar harto..cae sentado. Kruphix, God of Horizons .- mano al maximo, no se pierde mana. Kydele, Chosen of Kruphix .- mana incoloro para bichos grandes. Lorescale Coatl .- si vas a robar harto..este es el bicho!! con arrolar...uff! Progenitor Mimic .- copias a cada rato, vamos copiando muros..o bichos del oponente. Rashmi, Eternities Crafter .- puede servir..hacer correr el mazo..es una opcion. Acidic Slime .- mono toolbox..siempre util. Terastodon .- con UG no mataras muchos bichos, esto puede ser util. Kefnet the Mindful .- aqui tiene para activarse rapido. enchants:le sacaria:Mind Over Matter .- esta carta es buenisima..pero aqui no pega con niuna puta wea.Ni recuperas cartas, ni giras permanentes a excepcion de tierras.nah. Exploration .- si puedes conseguirle..con dolar bajo..es una wena idea. Leyline of Anticipation .- bichos con flash!! ou yeah! Garruk, Primal Hunter .- Garruk Wildspeaker pseudo ramp. Time Warp ? turno extra??? o sea nunca viene mal..pero es un poco inconexo..hay cosas mejores. Praetor's Counsel .- cartaza, recuperas lo botado, mano al maximo.Para finish. Urban Evolution, Pore Over the Pages , Harmonize.- buenos cartones mid tempo para robar. Simic Charm .- protege bichos, agranda bicgos..uff. Unexpected Results .- si te decides por monos garndes..uff demoledor. I don't have enough flyers already. Also, Ambush Vipering (by the way, I could add this one too!) my opponents is just a great feeling. They'll lose they most valuable creature on a stupid deathtouch guy or waste a removal. Either way it's a good deal for me. As explained in my description, Kiora put me over the top several times and I'm not getting rid of her for this reason. I wasn't so sure about her in the beginning either but experiences have showed me I should keep her. Maybe take out Simic Sky Swallower, Winged Coatl or Fleetfeather Cockatrice as they do not offer much apart from their keywords. Also Kiora, the Crashing Wave may not be strong enough? She looks very fragile and I assume that she usually won't provide much value. hecklefeckle on Free Cards? Sure! I also think some beefy beatsticks would be helpful. 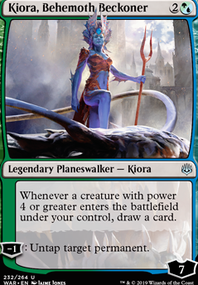 I'm talking Terra Stomper, Stormtide Leviathan, Simic Sky Swallower, Kederekt Leviathan. Some more good removal: Imprisoned in the Moon, Song of the Dryads, Cyclonic Rift. Gotta have cyc rift.